This Saturday night, March 30, Denial Events and 747 Presents partner for one of Miami Music Week’s most talked-about events of the weekend. Moksi & Friends takes over the Red Room at The Shore Club as part of the highly-anticipated Denial Music Week. Joining the DJ/production duo, Moksi, are friends Curbi, Born Dirty, HARBER, Damaged Goods, and PRANKSTISCI. Moksi are no strangers to Miami Music Week and can be seen across various events throughout the course of the week. One of their most special performances of the week? Their very own Moksi & Friends showcase at the Shore Club. Moksi, the duo discovered by Barong Family, consists of members MC DMC and Sam O Neal. Their latest single “On The Block” was just released on March 15 via Mad Decent, and the duo is best known for their tunes “Lucky” (Barong Family), and their “Powermove” collab with Hardwell (Revealed Recordings). Among Moksi’s friends is HARBER, a producer/DJ/musician hailing from NYC, who is making his Miami Music Week debut after exploding onto the scene in 2018. Following the release of his new single and fiery music video with Lexy Panterra (“More Than You“), HARBER has remixed the likes of The Chainsmokers, Dan + Shay [Z100 supported, Grammy-Award winning “Tequila”], Khalid & Normani [EDM.com Remix of the Week], Prismo [PRMD Music], and NOTD & Bea Miller, among others. *All entries must be submitted by Friday, 11AM EST. See ya in Miami!!! Stoked to be making my Miami Music Week debut this Saturday at Moksi & friends 落Who am I gonna see there? 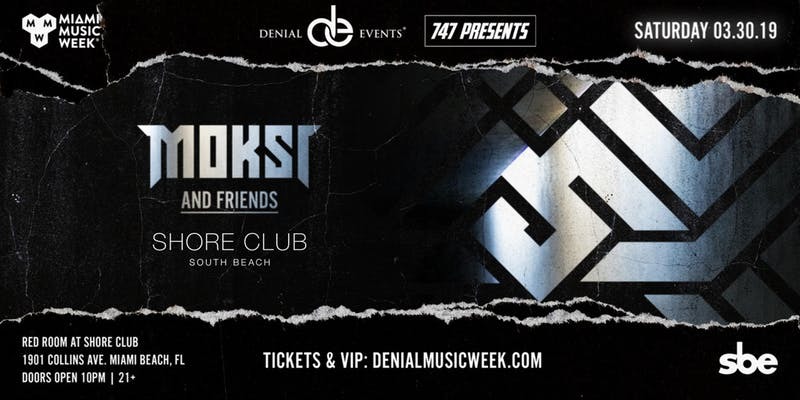 Tickets for Moksi & Friends presented by Denial Events, 747 Presents, and SBE, are available HERE.